Nobody is really fooled by the latest policy shift of the Boy Scouts of America that will allow membership of girls. The announcement was packaged as a way to provide “more options for parents” who want a single site providing activities for all their children. However, everyone knows the move is just one more surrender to a world gone mad. It should be so easy to understand. Girls cannot be Boy Scouts because they are not boys. Call it something else but not Boy Scouts. The iconic institution will now represent neither boys nor scouts. Perhaps fantasy hunters would be a better name. The move is one more step in a process begun five years ago, when the group agreed to accept openly homosexual youth members and adult volunteers. More recently, the rules were changed to include transgendered “boys,” who are really girls. Unsatisfied with these concessions, activists are now clamoring for allowing atheists into the organization. 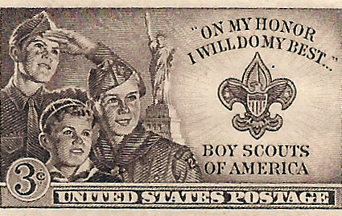 The self-destruction of the Boy Scouts is sad since it represents the loss of American innocence. Not even boyhood is safe from the perverted agendas of the gender police. There was a time when a boy could be a boy. He could play with toy soldiers. He would join neighborhood games and engage in unsupervised play. He could ride his bicycle far from home and sled down what seemed to be dangerous hills. If he lived in the country, he would explore forests, swim in ponds or fish in streams. He would assume boyish responsibilities, embark on boyish adventures and seek employment doing boyish jobs. Being a boy was exhilarating and boisterous. Parents understood this and made every effort to prolong the chaste pleasures of boyhood, and to secure for all boys the right to be boys with other boys. At the same time, parents constantly prepared them to grow up and become men. For a long time, the Boy Scouts had an auxiliary role in helping many boys be boys with other boys. Most people associate the Scouts with teaching boys many skills associated with camping and outdoor activities that catered to their boisterous social nature. All this changed with the recent policy shifts of the Boy Scouts. By shamelessly caving in to the culture, the BSA has dishonored its oath and its law by turning itself into a social laboratory for imposing equality upon everyone. No longer a school of moral formation, it will be one more institution that will based itself on the fad and fashion of the times. It will teach boys to give in to what others think, not stand firm on principle despite all odds. People mistakenly think modernizing organizations to keep up with the times will attract youth and increase membership. Indeed, the Boy Scouts claim the new rules will attract hundreds of thousands of girls. However, the sad truth is that a watered-down message attracts no one. The exuberance of youth is suited to the championing of great causes with strong messages. Membership number will continue to go down. Worst of all, the policy shift breaks the innocence of countless youth by injecting the culture war and its brutal sexual revolution into the lives of young boys at a time when they are not equipped to deal these issues. It is cultural child abuse of the worst kind. Of course, the role of the Boy Scouts never was to be in charge of the complete formation of the boy. The family is the primary educator that must instill morals, restraint and affection to the boy. Nothing can replace the family in this important function. The Church is yet another key element of the boy’s education since the Church introduces the supernatural virtues into the life of the boy that help him overcome disordered passions. The Church directs the boy to become a saint, a true and manly hero consumed with the love of God. Thus, today’s boys still have options—also adversely affected by the culture—to help them become gentlemen. However the corruption of the Boy Scouts represents one less place where boys can be boys with other boys. There is one less institution that holds honor and duty sacred in a relativized world. The “girlification” of the Boy Scouts impoverishes the social landscape of the boy at a time when social media and video games will fill the void. There was a time when boys could be boys with other boys. Girls cannot be Boy Scouts because they are girls. It is not difficult to understand. This entry was posted in Fighting the Culture War, News Commentary and tagged America, boy scouts, boyhood, boys, equality, gender, girl scouts, girls, Scouts, sexual revolution, transgender by John Horvat II. Bookmark the permalink.